A few weeks ago I made 300 canapes. All in a good cause (to help raise funds for my daughters’ school) but it did take me and my sister the best part of a day. My mass catering exploits have over the years included making chilli con carne for 50, a barbecue for 30 and sausage and mash for 20 (the latter from a tiny kitchen with only 2 saucepans). People in Dubai who haven’t taken leave of their senses usually ring the caterers. Time Out Dubai lists over 900 restaurants (there are many more) and the majority have some sort of home-delivery or outside catering service. It doesn’t have to be grand, and with much of the year being perfect for holding a party outdoors, some of my favourite evenings have been fuelled by a cheap and cheerful curry or a shawarma stand in a friend’s garden. 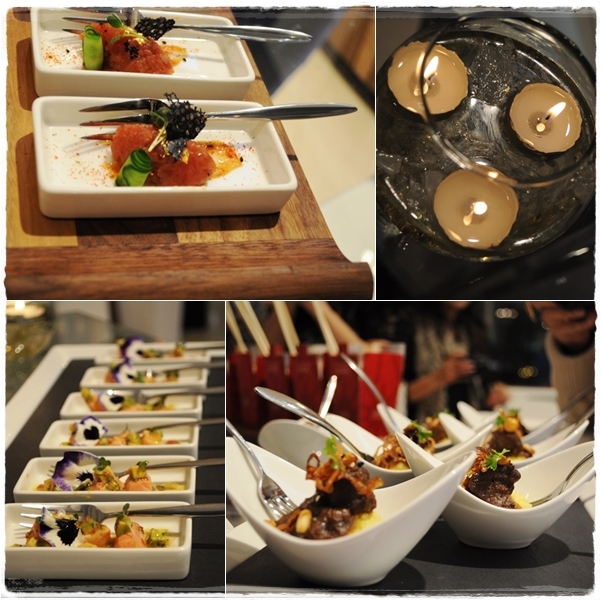 Ceviche, tuna miso embellished with gold and mini lamb tagine with couscous. I love the concept of the canape. All the fla­vours of an entire plate­ful, heaped extra­vag­antly into one per­fect mouth­ful. 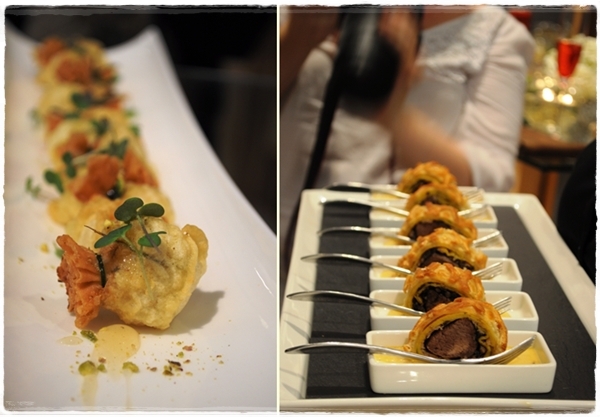 Has the canapé reached a new standard of sophistication and creativity in Dubai of late? I hovered (and hoovered) at the blini stand at Traiteur, Park Hyatt recently, part of a range of exquisite morsels brought out that evening including minute lemon meringue pies. The Cavalli Club served spoons (in the shape of high-heeled shoes) containing confit of duck and Dish delivered old favourites like mini fish gougons and chips and Aberdeen angus burger with truffle mayonnaise prepared with panache at a private party. 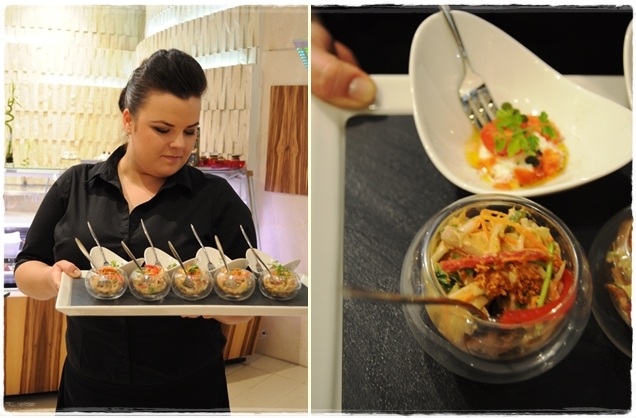 New entrants to the events catering arena, Lafayette Gourmet, invited Fooderati Arabia to sample their new menu last week. You get to Lafayette Gourmet by threading through expensive fashion, displayed like art in a post-modernist gallery, rounding the corner into banks of fresh produce from chillies to quinces and seried rows of gleaming jars. It’s an emporium of a huge range of fresh foods and ingredients plus you can eat at various places dotted around the food hall from an extensive menu. A blackboard announced us, a nice touch, and coloured drinks welcomed us; we then embarked on what might easily be called a marathon of appetiser eating. A ceviche adorned with an edible pansy tasted as good as it looked and a tuna/miso concoction beautifully decorated with edible gold leaf and a squid ink wafer was also excellent. My head was turned by the foie gras bon bons with crushed brioche and walnut (see picture at the top); this was cold in contrast to a hot breadcrumbed duck liver parcel teamed with cranberry, both were sublime. 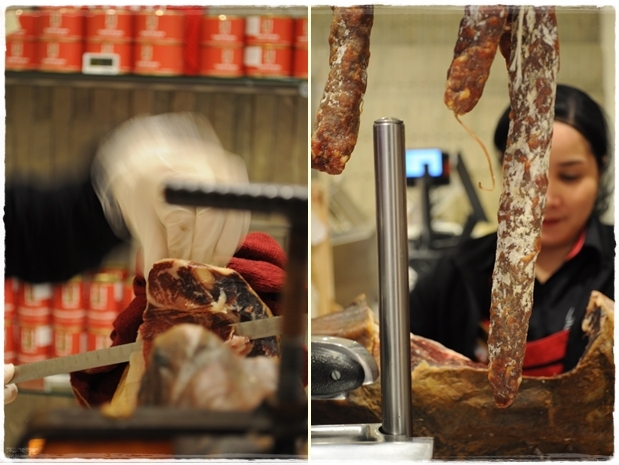 Prising myself away to the pork room, I spent a very happy time there making very good friends with the sweet, salty, addictive Jamón ibérico which was expertly carved on the bone (not easy). I returned via the cheese room and a sample of some very ripe Brie which was oozingly good, from the huge selection of, mainly French, cheeses. Wagyu Beef Wellington could have been a fraction pinker but this is quibbling as the yielding texture of the meat and layering of tastes meant they disappeared rapidly. Cute cartons of noodles were brought (tasty but could have been spicier). The goat’s cheese parcels drizzled with thyme honey were another highlight of the evening. Wagyu wellingtons in the spotlight. When it seemed we could eat no more, dishes of paella arrived; a Spanish tapas bar will be added to the already extensive eating-in options very soon (the only small food KP really likes). The soundtrack to the evening had been ‘oooh’, ‘mmmm’, and ‘mmmMMMMmm’. The waiting staff had finally become accustomed to cries of delight followed by instructions not to move a muscle while we all took photographs from every angle before diving in. A crescendo was reached when the desserts appeared, ‘oooooooooooh!’; cute little cones topped with mini-marshmallows or caramel popcorn, chocolate-coated ice-cream pops shrouded in a mini ice palace, dainty petit fours and tartlets, double chocolate brownies, chocolate fondants with vanilla sauce, salty churros with dark chocolate for dipping and cubes of excellent panettone. 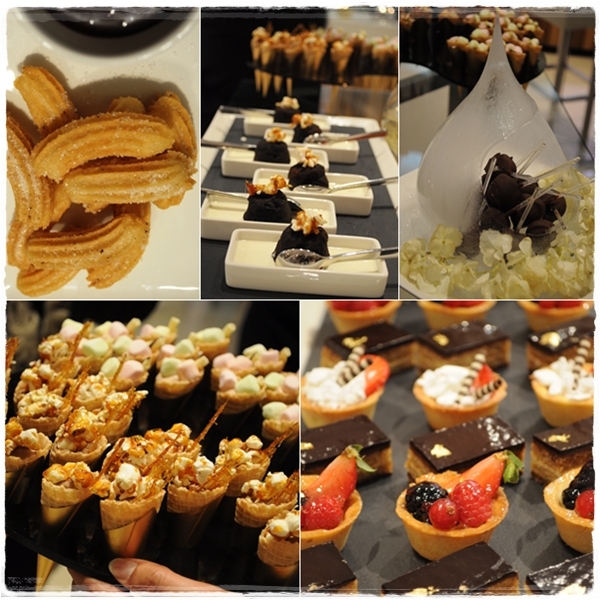 Churros, chocolate fondants, ice-cream pops, cones and tartlets – a sampler of the dessert menu. 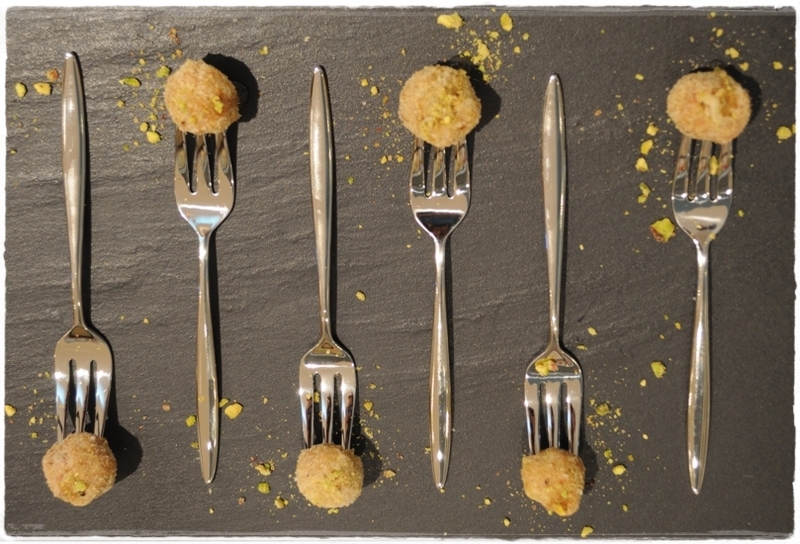 Who wouldn’t be in foodie heaven after this Brobdingnagian feast of Lilliputian delights? * However what really set the Lafayette Gourmet food apart from other caterers in my opinion was the quality of the ingredients and the personal involvement of the ‘Gourmet Culinary Director’ and very, creative chef, Russell Impiazzi. Lafayette Gourmet only use ingredients from the food hall meaning that, for instance, the simple looking buffalo mozzarella and tomato,basil gazpacho was soft, melting and creamy due to the quality of the cheese. Russell orchestrated the constant flow of delicacies and was positively glowing with our reaction. He admitted that he loved our enthusiasm and the interest that so many of the group showed in how the dishes were made. If this has got you thinking about your next event, Harriet from Lafayette Gourmet was keen to point out that they can cater for large parties, wedding, corporate events, with live cooking stations and the like, to gourmet sandwiches for a meeting, to dinner for a select few (about 10 as a minimum). The large range of event menus is in the brochure here. As the team took such good care of us I’m betting they extend that kind of attention to detail to their outside catering. 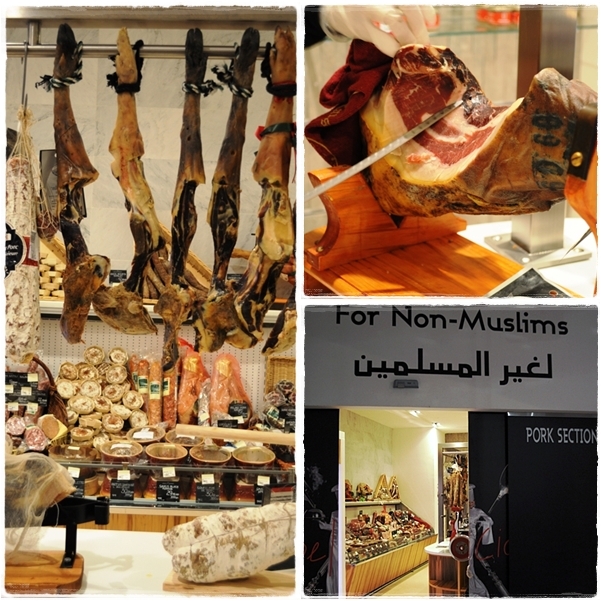 Jamon Iberico – the bones sell for 199 AED a piece – behind closed doors in the pork section. *This is going to qualify for Tangerine and Cinnamon’s Foodie Pseudery if I’m not careful! I’m already planning my next date with Lafayette Gourmet and yes it may involve something from France and something from Spain. And who knows, next time you might not ‘always find me in the kitchen at parties’. 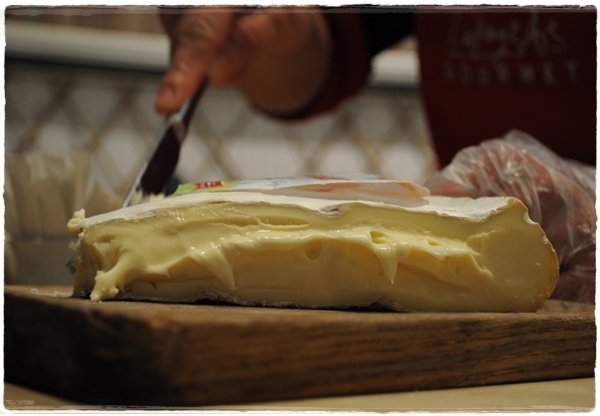 That cheese looks really amazing… I’m feeling hungry for cheese now. Mmmmmm cheese. Didi and Dee – you should have been there! wow what beautiful looking food. I am so jealous that I am so near and yet so far. While all of this food is incredibly appealing, I am stricken by the photo of the goat’s cheese parcels on their sides drizzled with thyme honey. My, my…I will try to make those soon. Great post. Thanks Flavors of the Sun, Anita and Rosa May – sorry to tempt you from afar. They were indeed delicious. Great round-up of Lafayette Gourmet’s delights. I too was really impressed with their canapes, and would certainly recommend their outside catering, and in-house dining too :). Their pork section has to be one of the most extensive and affordable selections in this city. I’m going back to that pork room very soon! Beautiful food! But I also love the informal shawarmas and kabobs for catering too! Yes – that’s KP favourite…his eyes light up when there is a shawarma stand. Wow – beautiful food and mouth-watering pictures! I can only imagine how much work it was, but I’m sure the cause was worth it. Oh please don’t think I made all these – I did have a good try at eating all of them though! Wow. Those dessert canapes look like my idea of heaven. Wish I could have been there! Stunning! 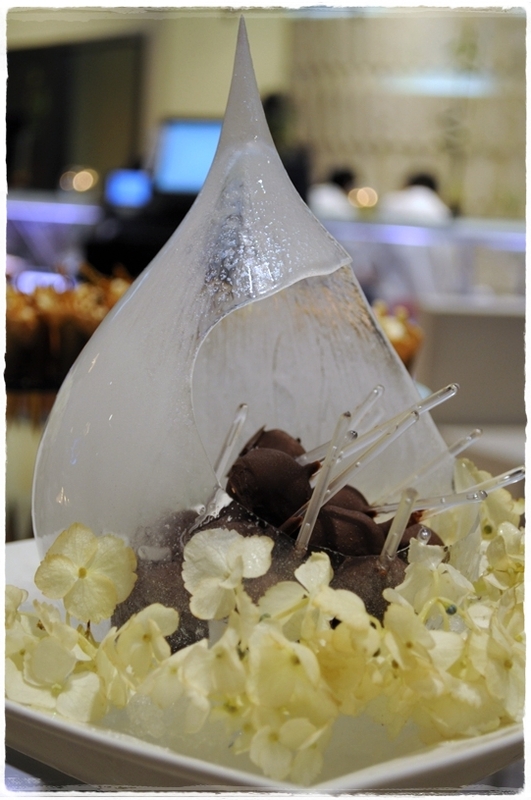 I LOVE that ice cave with the choc ice cake pops! I’m with Urvashi, the ice cave is stunning. I love churros too. In fact, it all looks good. Lucky you! Thanks Urvashi, Ren and Little Loaf – it was quite heavenly. It’s a canape lover’s shrine. How magnificent everything looks and I can’t help but wonder precisely how the extraordinary ice creation was made. Did they fill a balloon with water, freeze it and then blast a hole through it with a blow torch? I do hope KP is a new convert to the glories of the canape! Clever – yes that’s exactly what they do. Chef Russell advises always to make a spare in case the first one goes wrong. I don’t think anything will convert KP to the canape unless it was a pasty! I am seriously wishing I went to that event but your beautiful pictures certainly made me feel like I was there. Everything looks wonderfully enticing. You’ve broadened my knowledge of Dubai and how it’s posed as an international food destination. Thanks Joan – it’s such a multi-cultural city, and that’s reflected in the food. Thank you. Artificial light is death to food photos but happily it still looks edible! Wow! These look amazing! I’m with Eggs on the Roof here, the canape offers so many presentation opportunities and their size means you have the perfect excuse to try every variety on offer at the party! The only time I don’t like them is if you’re standing up with a drink in one hand and impossible to eat. But as a concept I adore them! Yes that’s when they have to be bite-sized only. Glass, plate and fork combo doesn’t work! whoa whoa! All these descriptions and pictures of food is making my head spin!! I just want to go there and try a little bit of everything!! Would love to visit Dubai some day! It’s a very different place to visit – and it’s a city of foodies! Come and meet us. Ah what a great read! Love your pictures. And how did you manage to link the menu, genius! Ah – the wonders of WordPress! I was so impressed by the facts and figures you had in your account. How did you manage to remember all the ingredients, all that information and tuck in at the same time? Great observation and I totally agree. It’s been fabulous to read everyone’s completely different accounts. Love the curve-ball approach that you, as ever, bring to your view. No thanks needed – a few emails were exchanged, LG deserve all the credit. Neat! I missed the international food festival in Dubai and now this! Wow! would have love several of these refined bites! 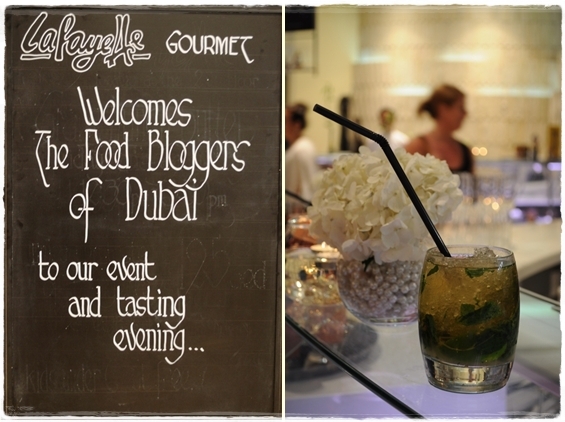 Get in touch if you are ever travelling this way – Dubai is becoming more and more exciting in food terms. Hello Meme, I don’t have a location or an office – I’m a blog. 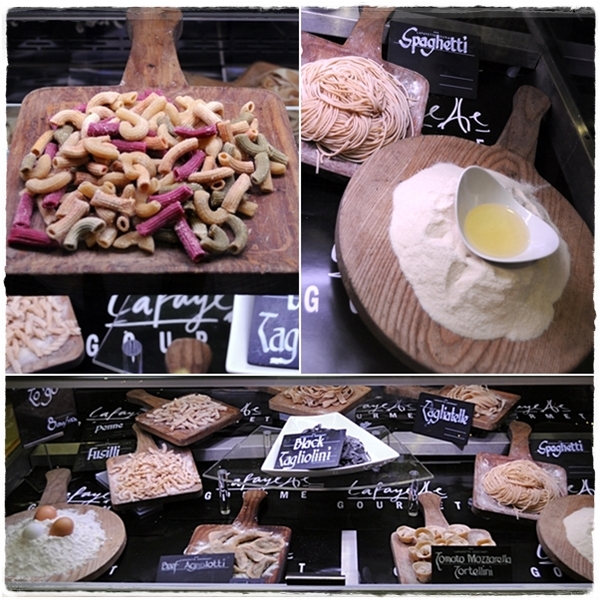 The location of Lafayette Gourmet is Duba Mall if you wanted to tatste. Sally, I’m really not a big fan of fancy food, but your posts always make me drool and wish I was there. There is so much elegance and care in the presentation! Such pretty stuff! I love the ice cave, and could go a churro with my cuppa tea right now. 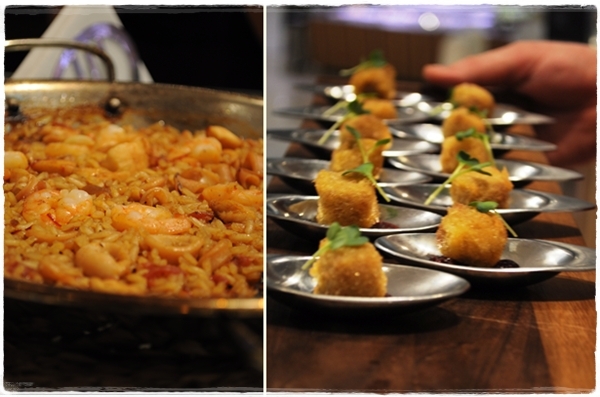 Looking to hire a chef or caterer?